In 25 words or less: The Mariners suffer the big inning, and Meche leaves early. However, the big inning isn't charged to Meche, which may seem unusual. This one featured Gil Meche going up against Mike Maroth. Meche was on a pitch count of about 75-80, looking to build on his relief appearance earlier in the week. Waaaay too quick. Ichiro bounced out to second. Yuniesky Betancourt rolled the second pitch gently to first. Raul Ibañez rolled a 2-2 pitch to short. Not a big inning. Curtis Granderson poked a 2-2 curve up the middle for a single. Placido Polanco reached on the first pitch and poked a single into shallow rightfield, enabling Granderson to move to third on the hit-and-run. Chris Shelton got ahead 2-0 and wound up rolling a 2-2 pitch deep into the left-side hole, where Betancourt made an off-balance throw to second to start a 6-4-3 double play, scoring Granderson. Carlos Peña whiffed on a 2-2 fastball outside. No threat. Richie Sexson grounded the first pitch to Brandon Inge behind the bag at third. Adrian Beltre poked a 2-2 fly ball to Marcus Thames in leftfield, who dove for the ball and missed as Beltre took the double. Jose Lopez popped a full-count pitch to Craig Monroe in shallow rightfield. Mike Morse took the second pitch in the dirt and Beltre overestimated his wheels, attempting to steal third and getting gunned down by five feet. Threat averted. Craig Monroe dumped the first pitch into rightcenter, where it appeared Ichiro and Shin-Soo Choo had trouble communicating, and Ichiro gloved the ball off the shorthop on the double. Marcus Thames popped the second pitch to rightfield, and Ichiro's throw to third hit Monroe in the back, allowing the latter to take third on the flyout. Brandon Inge lined a 1-2 pitch right to Beltre on a backhanded catch, and he walked to step on third, doubling off Monroe. Rinse and repeat. Morse popped the first pitch to shallow centerfield. Shin-Soo Choo bounced the second pitch to short. Yorvit Torrealba bounced out to short. Shigetoshi Hasegawa came in for Meche. Vance Wilson grounded the second pitch to short. 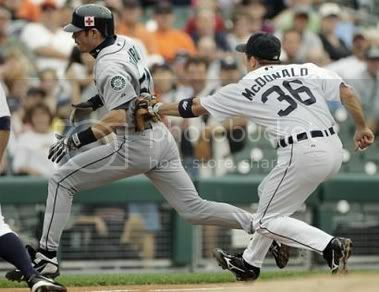 John McDonald looped a 1-2 flyout to Ichiro. Granderson flew out to leftfield on a 1-2 pitch. Vital sign. Ichiro poked the second pitch into the rightcenter gap for his 1119th Major League hit, breaking the record for the most hits in a five-year span. Betancourt lined the first pitch back to the mound, after which Maroth got Ichiro hung up between second and third, staying in a rundown long enough to let Betancourt sneak into second base (a high throw nearly went into rightfield, and the scorer gave Betancourt a single for some reason). Ibañez crushed a 3-0 pitch off the track and wall in centerfield, scoring Betancourt easily. Sexson flew out to fairly deep centerfield, allowing Ibañez to move to third. Beltre got ahead 2-0 and took a high full-count pitch for a walk. Lopez watched as Beltre was nearly picked off. Lopez flew out to centerfield. Very good. Polanco bounced a full-count pitch to short. Shelton flew out to fairly deep centerfield. Peña popped a 1-2 pitch to Betancourt near the leftfield line. Ick. Morse got ahead 3-1 and grounded the full-count pitch behind the bag at third. Choo whiffed on an 0-2 pitch. Torrealba took a 2-2 pitch over the inside corner. Game over? Monroe punched the first pitch through the left-side hole for a single. Thames spanked the second pitch through the left side as well for a single, moving Monroe to second. Inge bunted the first pitch in front of the plate, and Hasegawa threw to first as Monroe and Thames moved to third and second. Wilson stuck a 2-0 single through the left side, scoring Monroe and moving Thames to third. McDonald bounced the second pitch down the leftfield line for a double, scoring Thames and moving Wilson to third. Granderson rocked a triple to the rightfield wall, scoring Wilson and McDonald. Polanco popped the second pitch to centerfield, and Choo's throw was a bit embarrassing, failing to clear the mound. Granderson easily scored. Carlos Guillen, hitting for Shelton, popped to Ichiro on shallow rightfield on a 2-2 pitch. The inning was delayed by a couple minutes due to problems with the first-base bag. Ichiro chopped high to first. Betancourt popped the second pitch along the leftfield line, where Thames made a sliding catch to his backhand side. Ibañez smoked the second pitch toward first, but Peña leaped up to spear the ball. Rafael Soriano came in for Hasegawa. Peña whiffed on a full-count fastball over the outside corner. Monroe fell behind 0-2 and flew out to centerfield on a full count. Thames popped the second pitch high to Betancourt in shallow leftfield. Ho hum. Sexson got ahead 3-0 and walked on a full count. Beltre popped the first pitch to deep centerfield. Lopez doubled the first pitch down the leftfield line, moving Sexson to third. Morse popped the second pitch to Thames in shallow leftfield. Choo whiffed on an outside 1-2 pitch. Wind tunnel. Inge fell behind 0-2 and whiffed on a 2-2 fastball down the pipe. Wilson poked a 1-2 pitch through the left side for a single. McDonald fell behind 0-2 and whiffed on a 1-2 fastball. Granderson whiffed on a full-count fastball. Franklyn German came in for Maroth (Nook Logan came in to play centerfield, and Granderson moved to leftfield). Torrealba popped the second pitch to Inge in front of the mound. Ichiro doubled the second pitch along the rightfield line as the rains came to the ballpark. Betancourt popped the second pitch to Wilson behind the plate. The second pitch to Ibañez was inside and got past Wilson, enabling Ichiro to move to third. Ibañez rolled a 2-2 pitch softly toward third, where Inge charged and threw barely in time to get Ibañez. Jeff Harris came in for Soriano. Polanco got ahead 2-0 and later took a 2-2 pitch for strike three. Guillen poked the second pitch into centerfield for a single. Peña crushed the second pitch over the brick wall in centerfield (461 feet, longest homer in Comerica Park history), scoring Polanco. Monroe popped the second pitch to Betancourt in front of the second-base bag. Logan whiffed on a 2-2 breaking ball. Jason Karnuth came in for German. Jaime Bubela, hitting for Sexson, rolled a full-count pitch to short. Greg Dobbs, hitting for Beltre, popped a 2-2 pitch to Granderson in shallow leftfield near the line. Lopez rolled out to short. Ballgame. Very short outing for Meche. Injured probably. Never figured out during the game. -- he needs 4 hits to reach 200 for the season; he'd need to hit .159 for the remainder of the season, and that'd leave him with a .294 season average. -- he needs 8 hits to finish with a .300 average for the season; he'd need to hit .318 for the rest of the season, and he'd end up with 204 hits. -- he needs 22 hits to finish with a .320 (.321) average for the season; he'd need to hit .875 for the rest of the season, and he'd end up with 218 hits.